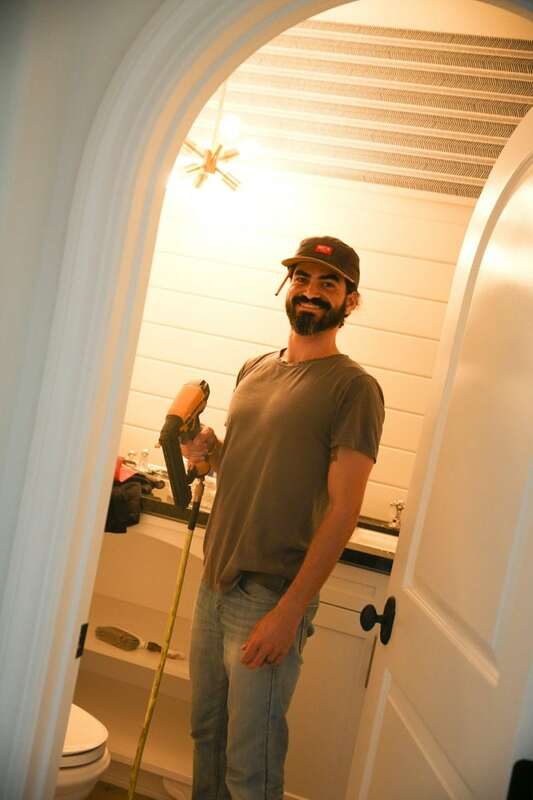 When we built our first home in North Carolina back in 2009, I fell in love with the look of trimmed walls. It’s no secret that if I could, I would have planks cover every inch of my home. 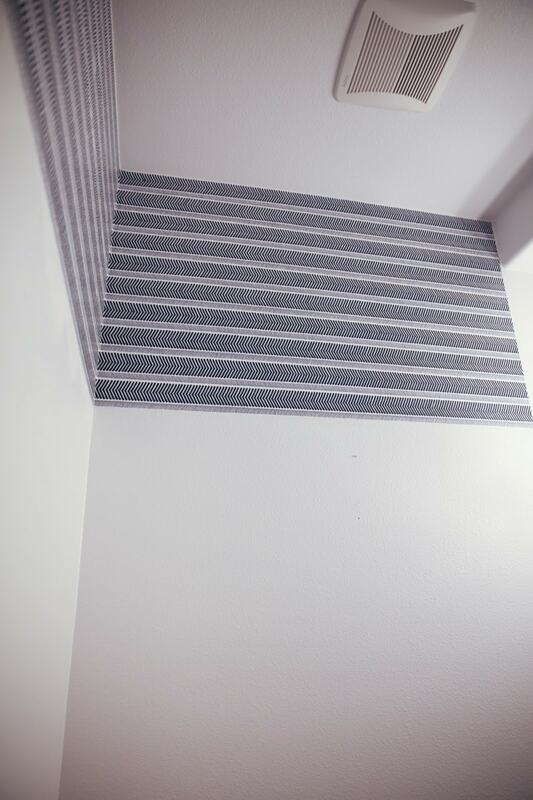 I love textured walls and the warmth trim brings as well as making the space look complete. 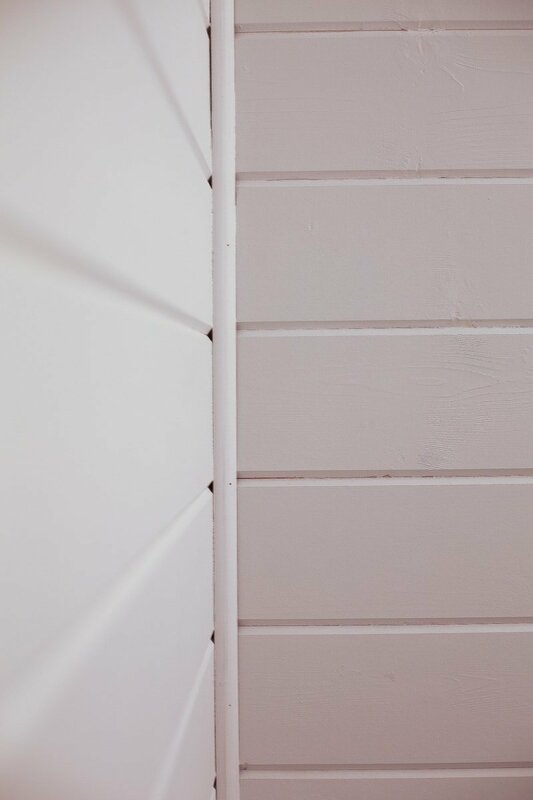 Shiplap is one of favorite types of paneling to enhance any space and as soon as we planted roots in Southern California, I knew I knew we would be using shiplap as our design staple. 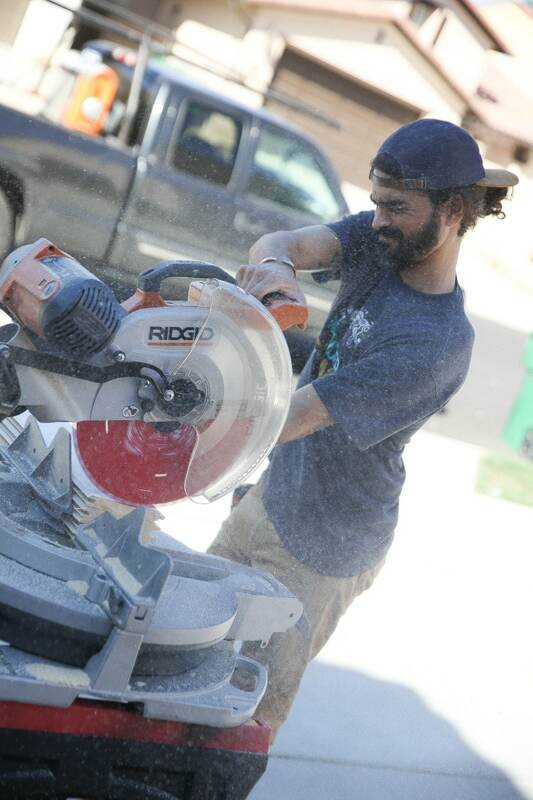 Lucky for us, we found an amazing artisan, who sees my vision and is able to put it into fruition with his talent. 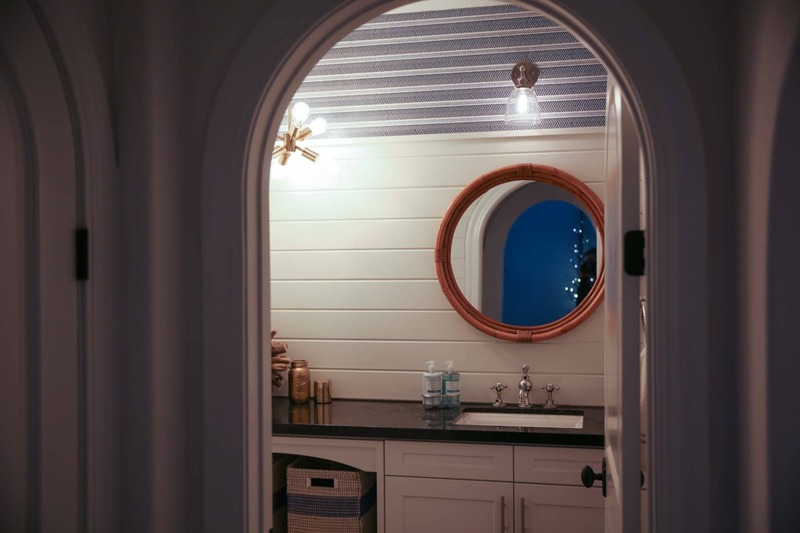 Shiplap, also known as tongue and groove, is a paneling style that can come in many forms, and you could see it in many trending catalogues and interior design magazines. 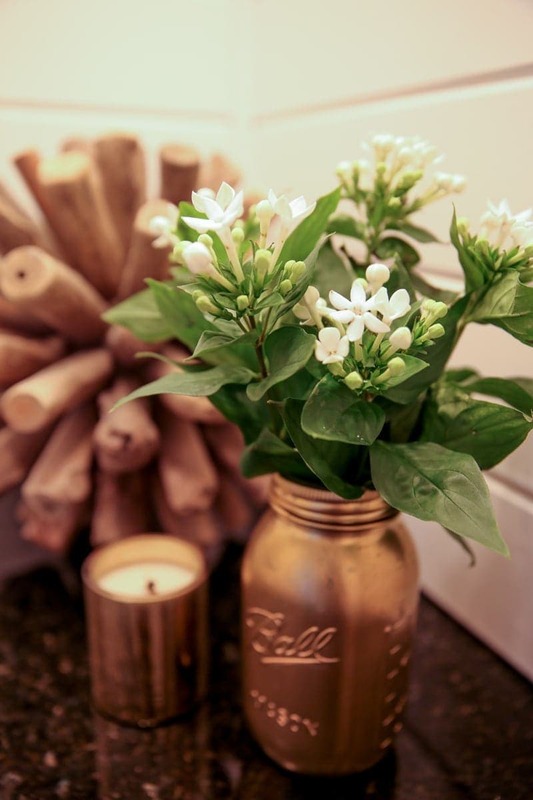 Its been around for many years and is quite popular in farmhouse spaces and craftsman style homes. I love its natural grooves and the way art, mirrors, shelving and all wall decor looks layered on top of it. It’s is my favorite type of trim for my love of where farmhouse meets modern. 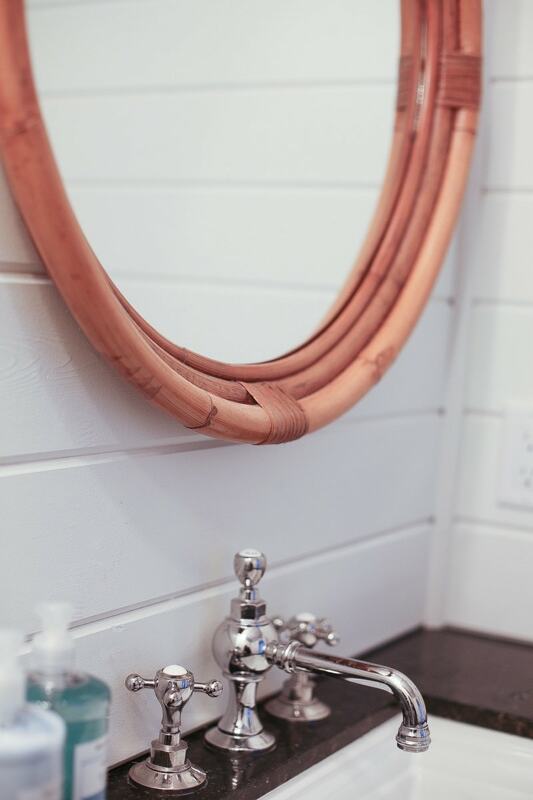 For my bathroom, I kept the vanity that came with the space. 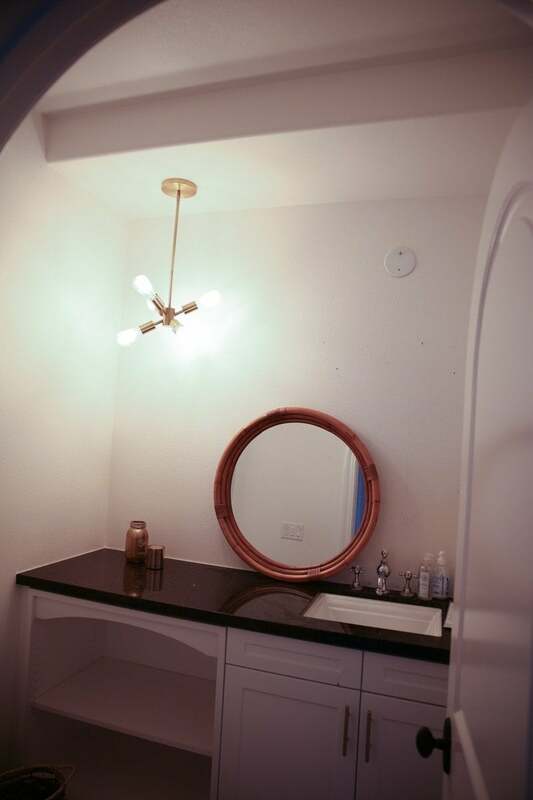 It has a black quartz countertop and thought if I could be creative with my walls, I wouldn’t need to replace the vanity. 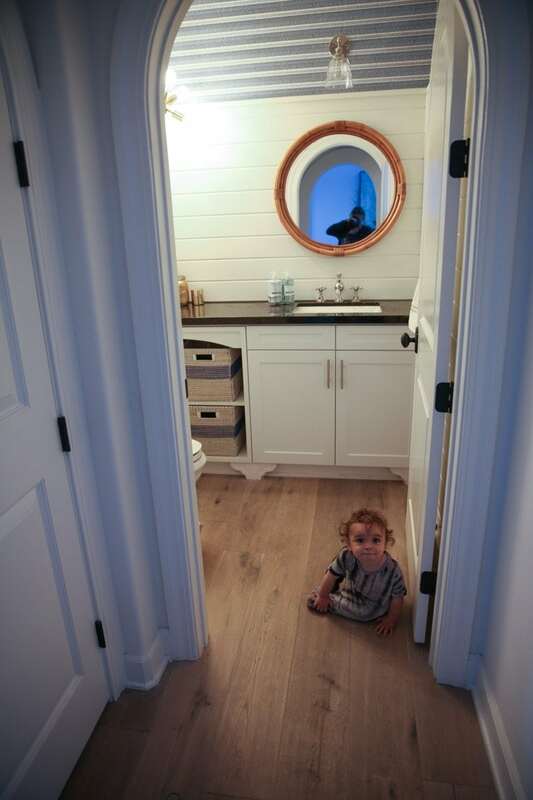 Bryan from Palacio Design Company, used shiplap planks and designed the space to make an impact. We decided to leave a good 27 inches of space (the standard length of one roll of walpaper) above the planks to add Serena & Lily Wallpaper. 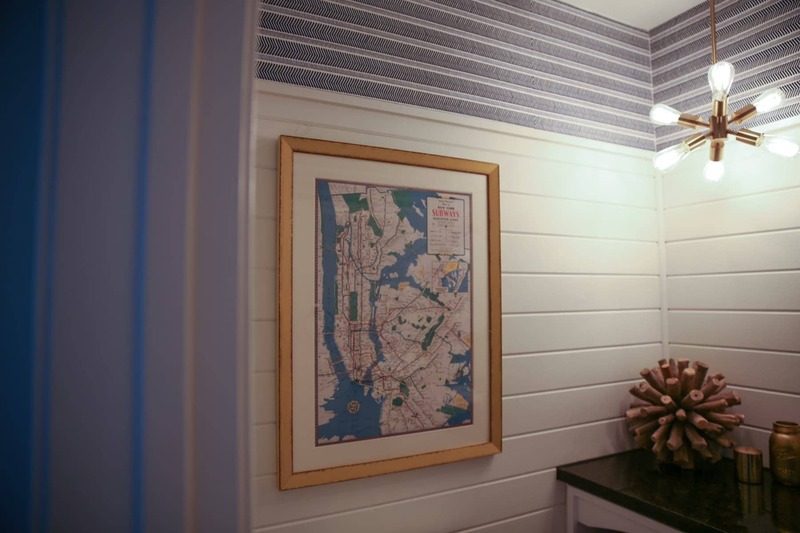 By filling the walls with shiplap and wallpaper, the space became so much more appealing and now makes more of a statement. 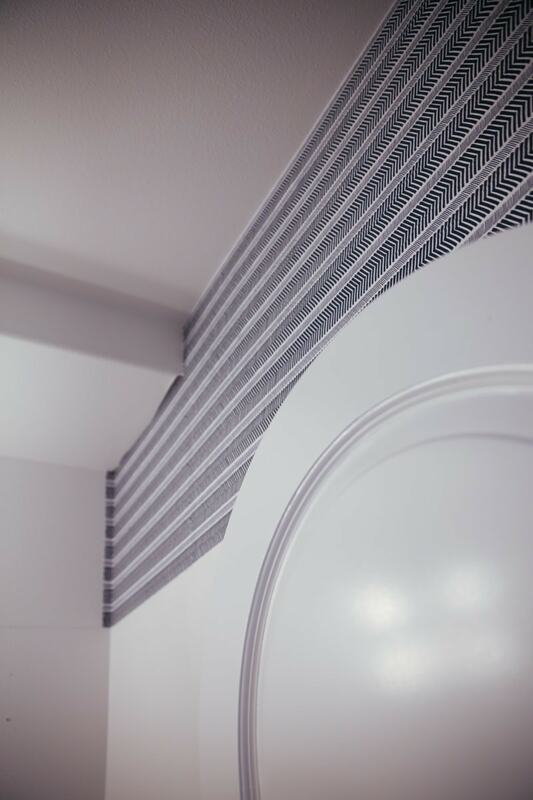 Painting the shiplap white complimented the looser lines of the herrigbone wallpaper. When choosing the hardware, I couldn’t decide if I wanted gold or my favorite, polished nickel. So I felt risky and opted for both metals in the space. 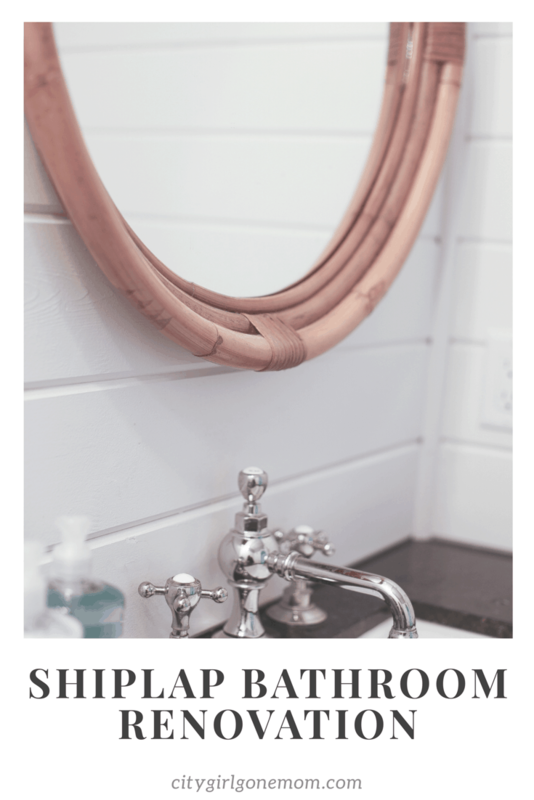 I used a West Elm gold modern pendant and above the mirror, I used a clear-glass traditional sconce from Restoration Hardware. Both lights utilize Edison bulbs giving the space a fun rustic feel. 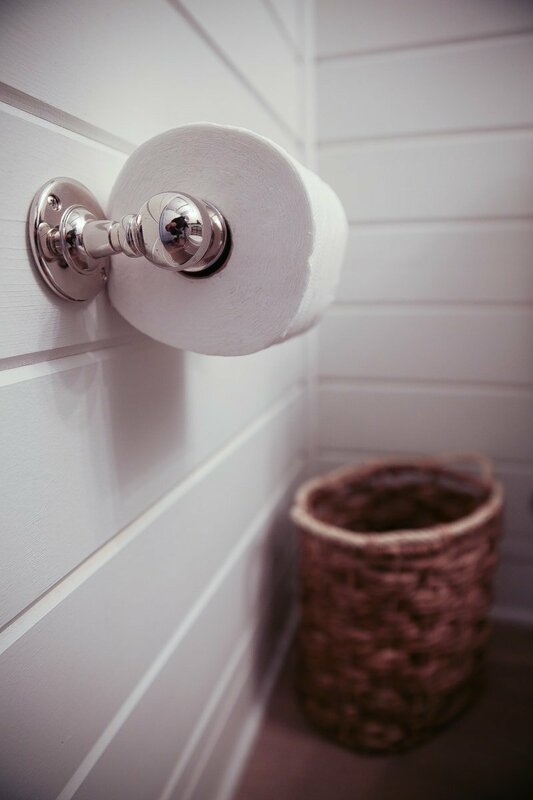 The towel holder, faucet and toilet paper holder are all polished nickel also from Restoration Hardware and look beautiful against the shiplap. 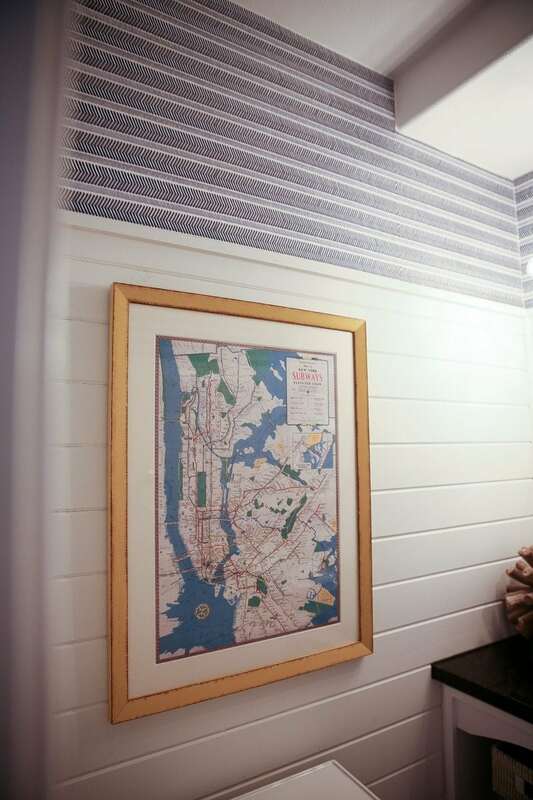 The pop of gold really works against the herringbone navy wallpaper from Serena & Lily. And surprisingly I am pleased with the mix of gold and polished nickel. When you are choosing accent pieces for a space you can’t go wrong with anything against white. I opted to use natural wood elements and gold to bounce off the gold pendant. The double framed round rattan mirror in its natural color worked really well. It popped against the shiplap and is also the same rattan used in my dining chairs. 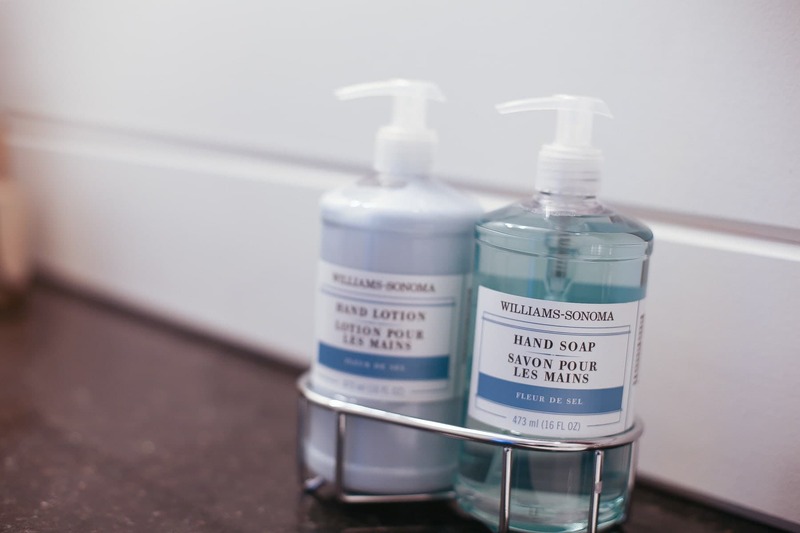 I also bought soaps from Williams & Sonoma Home. I always feel its important to have a good soap and lotion in your half bath and this Fleur de Sel set sits nicely in a chrome holder. 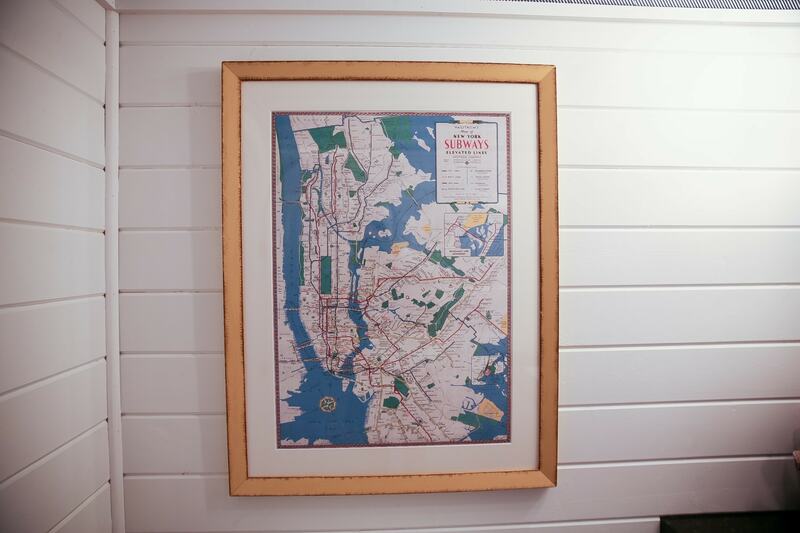 I up-cycled a poster a friend gave years ago of the elevated NYC transit system. A great choice for this NYC girl needing NYC swag. And for the other accents I bought a gold mason jar from Etsy and the wood element is from West Elm. 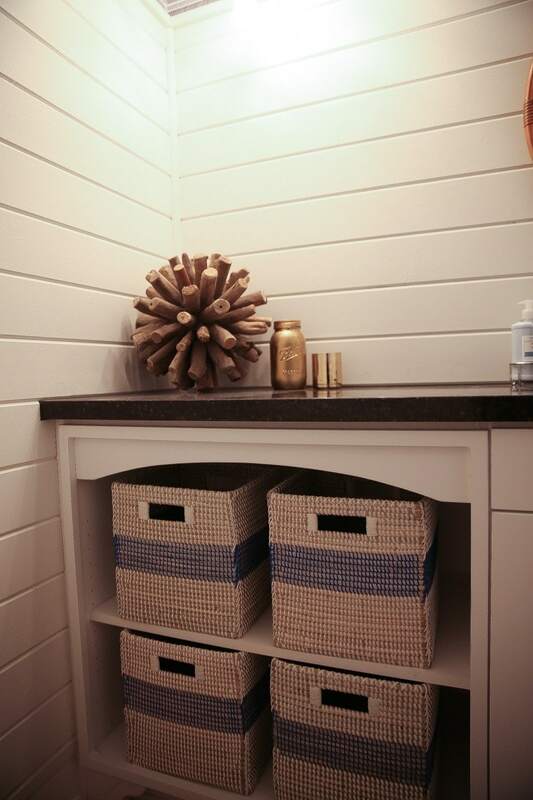 I opted for bright, beachy bins from Serena & Lily that favored the herringbone wallpaper. 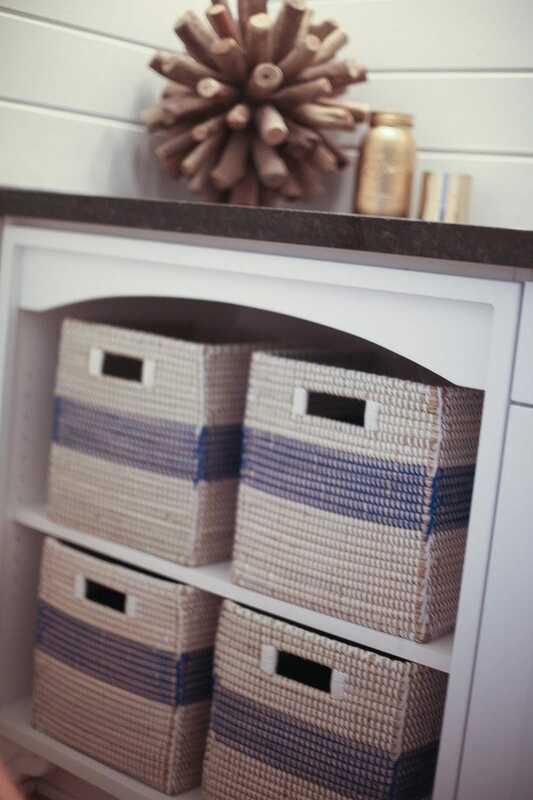 These earth friendly hand-made bins use recycled plastic that’s wrapped around seagrass and even more, have great storage space. I would like to say my home style would be modern farmhouse. 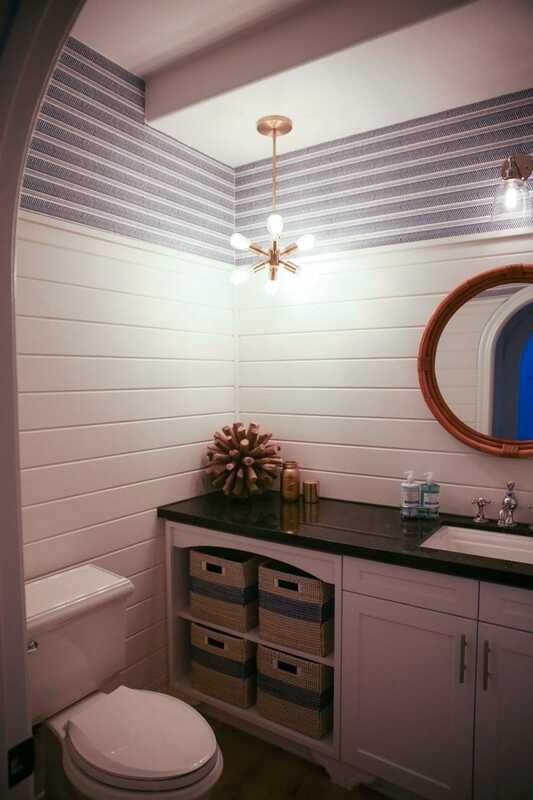 Shiplap is a very effective architectural detail no matter what your style preference is. 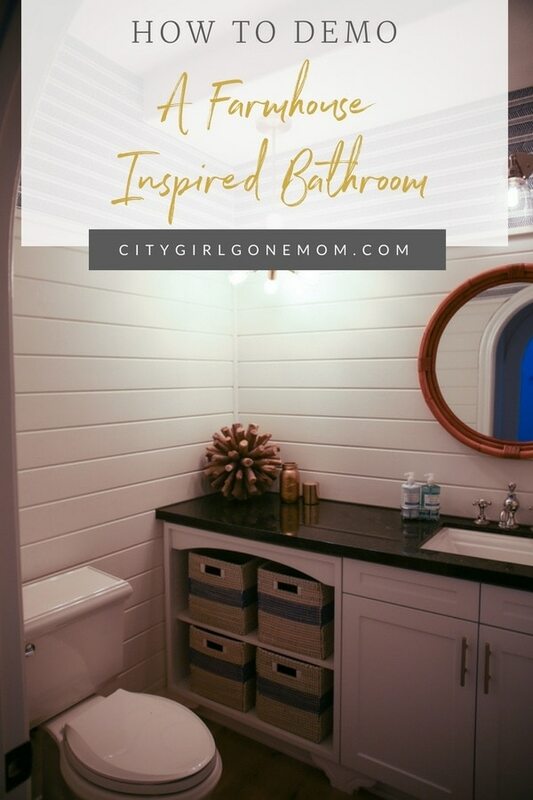 Another fun perk is you could paint the shiplap in any color you like or leave it in its natural wood. 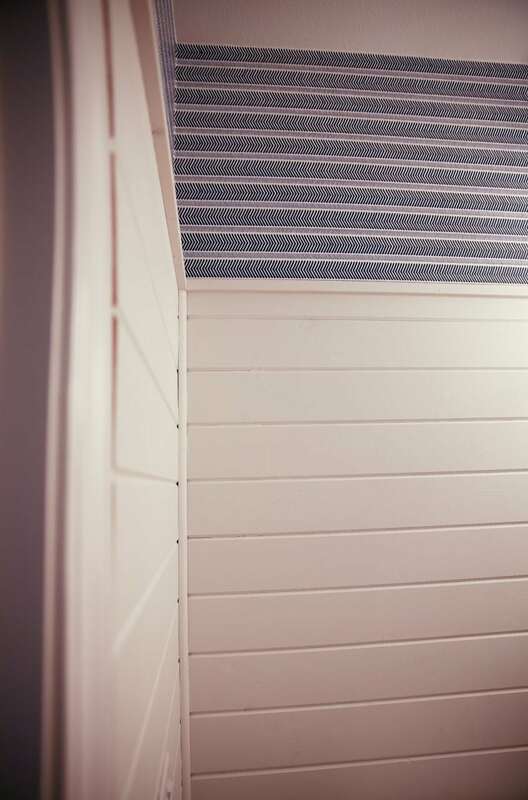 We will be installing shiplap in a few more spaces in the beginning of the new year. 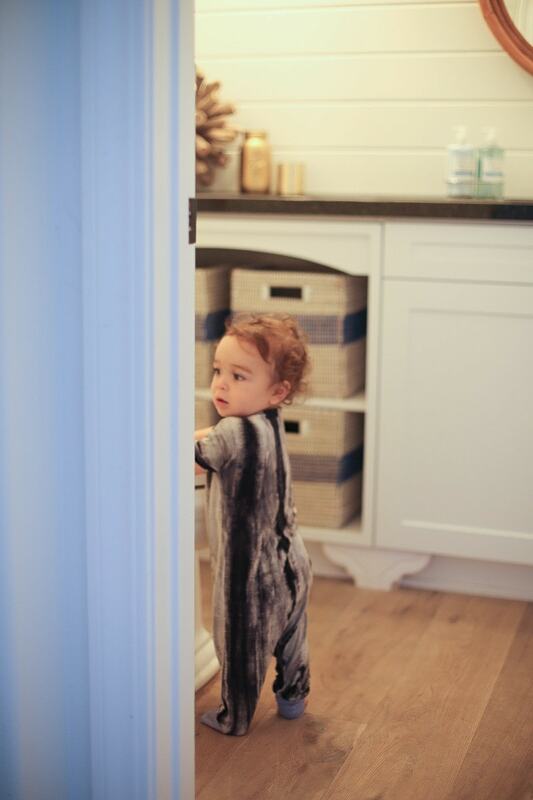 I can’t wait to show you each room as we complete them, one space at time. I would love to hear from you! What’s your favorite type of trimmed wall? Comment below. Also, if you are local to San Diego and would like to contact or see Bryan’s work, please click here. You have such an eye for design! Looks incredible Danielle!! Can’t wait to see more! Thanks babe… means a lot…. This is beautiful! 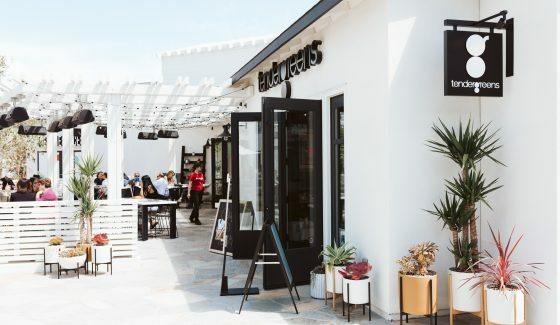 Love everything about this space. Very nice job! 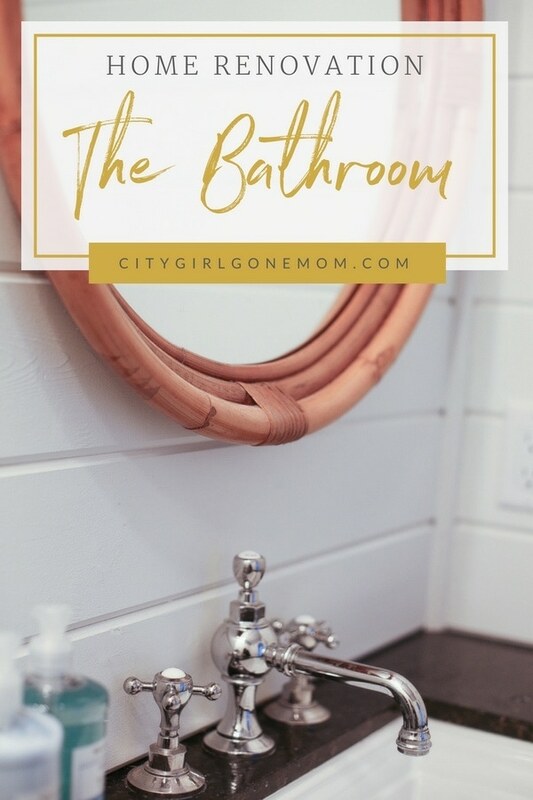 Your bathroom look awesome!! !